Hello, I just received a new second gen 8 zone controller. 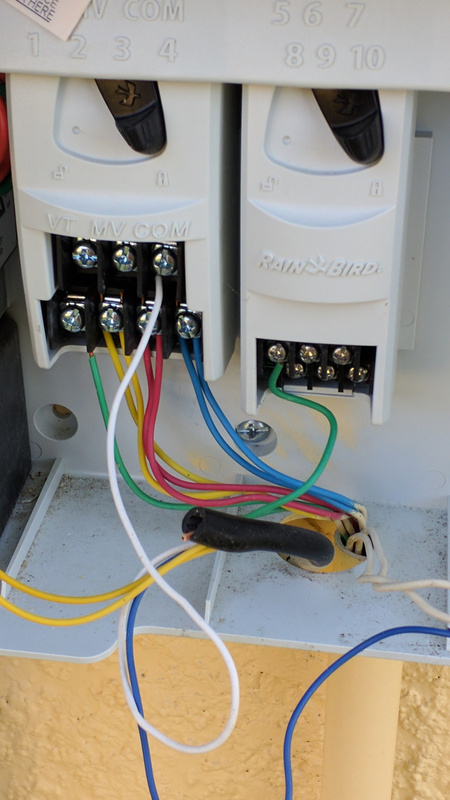 Looking at the existing rainbird esp-me controller I see two wires for 3 of the 5 zones. Don’t know the installers intent… Do I really have 5+3=8 zones? Here is a photo. Should I connect the wires in the same way to the new controller? Or maybe split them up into 8 zones ? @Mouse - Congratulations on the new Rachio and welcome to the community. I could be that there are eight zones. Are there eight (probably round green) valve spread out over your yard for the different solenoids/zones? I’d probably take one wire out of each of those three zones that are double and quickly run the zones noting where the system is watering. Then do the same process with the wires that were left out in the first step. If different areas water, then I’d put each wire into it’s own zone on the Rachio. If the same area is watered, then you can keep the wires doubled on the Rachio. The wires look the normal size (gauge) so I don’t think they would have used two wires to carry enough current to activate the solenoid. So if nothing waters in the two steps above, they used the two wires to carry more current. Are the runs to those three zone very long? I tried that, the same zone waters with all the same sprinklers. They seem like redundant wiring. Any reason a builder/installer would do this? @Mouse - the only things I can think of are a) a long run where the current would drop over the distance so two wires were used to get enough current to the solenoid or b) they put the second set in as a fail safe if the first wires got cut. You can go with mirroring the current setup (doubling the wires for those three zones) or going with one wire per zone. Since it is working with two wires, I’d probably KISS and do the same thing - not knowing the original intent/problem/issue. @Mouse Builders and the irrigation subcontractors use the cheapest labor and not the most knowledgeable or accountable. Sadly, you and all new homeowners have to deal with it.